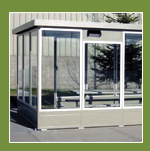 Specific environments require a number of different solutions to common problems. One thing we run into a lot here at HMC is having to battle with sound from outside the new modular we are trying to create in the facility. We offer three special panel make ups that can help soften varying levels of sound. First is the "Good" panel makeup. 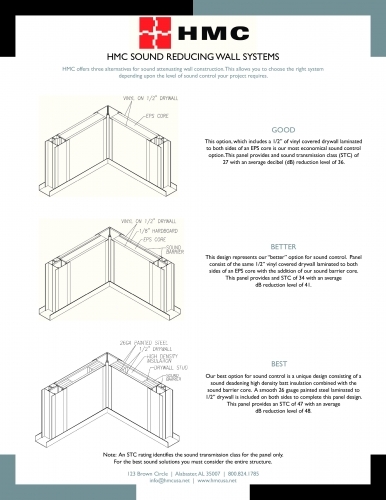 This option, which consists of 1/2 inch vinyl covered drywall laminated to both sides of a EPS core is our most economical sound control option. This panel provides a STC rating of 27 with an average dB reduction level of 36. Second is the "Better" panel makeup. This option, contains the same 1/2 inch vinyl covered drywall along with the addition of a sound barrier core. This panel provides an STC rating of 34 with an average dB reduction level of 41. Third is our "Best" panel makeup. This unique design incorporates the 1/2 inch drywall, the sound barrier core, and a sound deadening high density batt insulation. The panel is finished with a layer of smooth 26 guage painted steel laminated to the drywall. This panel provides an STC rating of 47 with an average dB reduction level of 41.